On Saturday, May 14, as the final whistle ended a 1-1 draw in the English Premier League between Blackburn Rovers and Manchester United, a man looking perhaps a shade younger than his 69 years began dancing around and hugging everyone in sight. 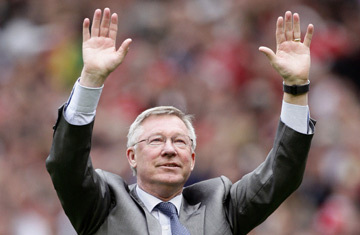 If Sir Alex Ferguson, United's manager, looked like a bit of a dork  as he usually does when celebrating  nobody cared. United had just won its 19th English League title, beating the record of its archrival Liverpool, the team that Ferguson had long ago promised to "knock off their perch." Of those 19 championships, 12, together with five FA Cup victories, have been won since Ferguson arrived in 1986. On May 28 he will go for another title, when United meets Barcelona in the final of the European Champions League in London. If his team wins, Ferguson will have his third European championship and United its fourth. Only Real Madrid, AC Milan and Liverpool have won more. But the bare bones of United's record  and Ferguson's  tell barely half the story. Analyses of sports clubs' commercial operations vary, depending on who's doing them, but in 2010, Forbes magazine ranked United the most valuable franchise in world sports, with an estimated worth of $1.8 billion  more than that of the New York Yankees or Dallas Cowboys  and that was before it signed a record $130 million shirt-sponsorship deal with insurance company Aon. United's international fan base, measured in the tens of millions (with much of it in Asia), is greater than that of any other team in any other sport. Sponsors include Nike, a Turkish airline, a Thai beer, the capital of South Korea, a Chilean winemaker and a bevy of telecommunications companies spanning the globe. But the global reach of the brand has not come at the expense of local loyalty. United's stadium at Old Trafford averages attendance of some 75,000 a game, in a season 10 months long. It's an astonishing record, but it's also a bit of a mystery. Manchester is an O.K. sort of a place, the cradle of the Industrial Revolution, with a famous club scene and a concert hall uniquely named after an economic theory, but it's not a capital city or a megalopolis. So how did this town in the northwest of England manage to produce one of the age's true global brands? And  even more mysterious  how has a single man, over 24 years, been able to sustain such excellence in his teams at a time when the social, economic, technological and competitive environment of his sport has been transformed, turning it into perhaps the only spectacle that the world truly holds in common? The story starts with a tragedy. On the evening of Feb. 6, 1958, a chartered plane carrying United's young team  England's champions, known as the Busby Babes, after their manager, Matt Busby  stopped off in Munich on its way back from Belgrade, where United had drawn with Red Star, securing a place in the semifinals of the European Cup (the precursor to the Champions League). Conditions were dire, with slush on the runway and snow in the air, but after two failed attempts to take off, the pilots tried again. The plane never made it, clipping a house at the end of the runway and crashing. Seven of United's players were among those who died in the crash. An eighth, Duncan Edwards, just 21, who men of a certain age will tell you with iron conviction was the greatest footballer England ever produced, died two weeks later. Busby was terribly injured and was administered last rites but survived. The horror shocked Britain. Even those who didn't follow football or weren't from Manchester had loved the Babes, who had brought a sense of glamour to a nation that was still struggling to lift itself from the drabness of the postwar years. I was just 6 at the time, and the Munich disaster was the first time I realized that really bad things could happen. We lived in the suburbs of Liverpool  both my parents had been born in the streets next to Liverpool's stadium  so United wasn't our team. But our next-door neighbors, a retired railroad worker and his wife, were big United fans, and I can remember, when I got home from school the day the news broke, feeling a child's surprise at seeing adults so visibly distressed. A few weeks later, we all crowded into the only house on our street with a TV to watch United's second string try to win the FA Cup, only to cruelly lose to Bolton Wanderers. Yet out of the ashes, Busby rebuilt the club. By the mid-1960s, he had formed a thrilling new team around three players known in United legend as "the Holy Trinity": George Best, Denis Law and Bobby Charlton, who was just 20 when he was hauled from the wreckage of Munich. Even I, a die-hard Liverpool fan (which is why this article is written through gritted teeth) loved seeing them play. In 1968, 10 years after Munich, they positively murdered Portuguese champions Benfica to become the first English side to win the European Cup. As the game ended, Busby marched across the field to embrace Charlton, two survivors united in a moment of shared joy and grief. See pictures of the faces of football. See pictures of Johannesburg preparing for the 2010 World Cup.